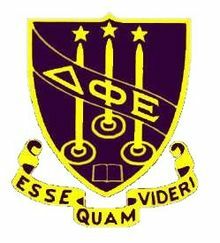 Delta Phi Epsilon is a group of dynamic women living by our motto “esse quam videri”, meaning “to be rather than to seem to be”. Everyday these women strive to be true to themselves and those around them as we follow in our Founder’s footsteps and cultivate well-rounded and balanced women by utilizing the five S’s of personal growth and development: Sisterhood, Scholarship, Service, Social, and Self. The Beta Eta Chapter of Delta Phi Epsilon follows our founding non-sectarian beliefs as well as our mission to provide a sisterhood experience rich in tradition, innovation, and opportunities for growth.